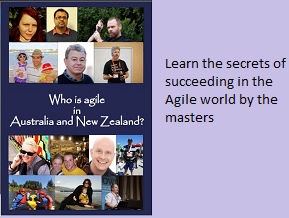 It is my pleasure to have Michael DePaoli contribute articles to my Agile blog. Michael comes with rich experience in IT and the detailed bio is at the end of this article. Happy reading. Recently, I heard folks at a few of my clients and at a couple conferences talking about why they are considering moving to using Kanban vs. Scrum. I have no preference to either method other than choosing the right agile development tool for the job. My concern derived from what I have heard identifies the beginnings of some myths and also demonstrates some of the hype around Kanban. >> Kanban with a capital (K) is the term David Anderson coined with respect to an agile development approach to driving change based on lean principles. >> Kanban with a little (k) represents the idea of the “sign” or “billboard” that provides the signal/visibility in a production line for additional demand for service of a particular station. It is one of the tools that enables just-in-time (JIT) action as described in the Toyota Production System. Kanban, as Anderson explains in his book, relies on change occurring in more of an optimizing manner (see kaizen culture). This is the significant difference between Kanban and Scrum. In a Kanban approach, an organization can begin with their current practices with a few exceptions. Kanban also demands a focus on quality. In fact, this is Anderson’s first step in his six-step recipe for Kanban. Quality comes first primarily because of the obvious cause-and-effect relationship to waste — and because it’s generally more in the direct control of technical management. Working down his recipe, there tends to be less control and influence over the changes by technical management. >> Scrum has work pushed onto the team while in Kanban work is pulled into the system. This is incorrect. Scrum does not have work “pushed through the system.” It is a pull-based agile development system with work pulled in larger batches (the Sprint Backlog). >> A Scrum implementation (as well as Kanban) becomes a ‘push-based’ system when the business doesn’t respect the current proven capability of its teams to produce value and just continues to push demands for service into the system. Hype: Kanban at its core is summarized by the premise: ’Stop Starting, Start Finishing’. The entire team’s focus is on ‘getting to done’ for the tasks in progress. This statement is certainly true of Kanban, but the implication that Scrum does not have this focus is not true. Scrum done right has the same focus, delivering software sooner and doing so in priority order to maximize the value delivered to the customer. I’ve coached to Scrum teams for years that, wherever possible, everyone on the team should work on the highest priority item and get it done first before starting on the next item in the Sprint Backlog. This implies limiting WIP, as well as focusing on delivering the Backlog in rank order. If the focus of a Scrum team is to just get everything in a Sprint Backlog into an in-progress state, regardless of priority, then you have a dysfunctional team that’s most likely not working cross-functionally and certainly not focused on delivering the highest-value items first. Hype: The statement, “The Kanban method is intuitive and is quickly and easily adopted by teams,” to me is a statement that’s used irresponsibly. It is too often a battle cry of those trying to sell Kanban as a product. It is the cop-out reason used by many organizations who are failing at Scrum and looking at Kanban. Over his 26 years in IT, Michael DePaoli’s experienced has included serving in different traditional roles in highly respected companies. The roles have included analyst, software engineer, quality engineer, development manager, project manager, Director of Engineering, VP of R&D, CTO and Consultant in companies, such as American Express, Sprint, Deloitte Consulting, Sapient, Knowledgepoint, Adobe Systems, AOL, NetApp and VersionOne. Michael works as an agile / lean coach and product consultant with the VersionOne services group. One of the criteria for selecting an agile tool in terms of Kanban or Scrum can be the time required. One of these methodology works well when there is shortage of time in terms of deadlines; the other one works well in situations where more time is required to carry out tasks when a diminutive iteration cannot satisfy the work.